Sally’s testimonials cover her color and space expertise, her paint store and design experience and her special efforts in her personal shopping for each client’s special requirements. Because she has over 35 years of testimonials both Nationally and International, she feels it best to use only those in this particular part of “Coastal” Florida that are the most recent. Please remember that Sally makes extensive use of “SKYPE” and “FaceTime” for many clients. Here are just a few of Sally’s clients’ reviews. Sally worked with me 10 years ago and totally nailed the colors for a new house I was building in Charlottesville Virginia. Although I am still loving the colors and could happily live with them for the next 10, I decided a spring project was needed and and fresh painting for the house would be a great one. What I so appreciate about Sally, is her keen eye, not only for color, but assessing rooms for their relationship to light and the feel of energy one wants to manifest. One of the first questions she asked besides the color palette I liked most, was what feel did I want inside the house with its outside metal siding and lots of tall glass doors/windows. By itself it projected a stark and rather cold feeling, especially with all the metal. And although flooring, curtains and other furnishings help customize, I was amazed at how just the right colors worked not only with the interior of the house, but worked with the lay of the land, house positioning, the natural environment etc. The colors we selected seem to blend with the changing light of day and night and bring such a warmth, and inviting, comfortable feel to the house, which I had hoped for and continue to enjoy. Until meeting Sally I never realized how important the ceiling color is for a room. And she has come up with such yummy shades of color that she knows intimately. Almost everyone who comes to my house, comments on how great the colors are and how much they like them. One room in particular has a bold color of green I never would have considered until Sally. The room is still quite alive, and fun and yet blends beautifully with the other colors chosen. So, I’m now in the midst of an exciting new change with my house that I adore and have reconnected with Sally for another consultation. I feel confident in her knowledge, skill, experience and exceptional talent in guiding me to more years of delight with the play of light and color. ( I might just keep the energizing green because I like it so much.) Thank you Sally for your amazing gift. Your expertise is rare and greatly appreciated. Sally is very knowledgeable and simply amazing! Professional and personable, she did an excellent job picking the right colors for our home and provided many ideas on how to configure/decorate our rooms and living space. Communication with her was easy and she instantly picked up on what kind of decor and style we liked. Sally sent us a many options that were stylish and affordable. Thank you for helping us make our house a home! Sally is amazing! She knew what changes would make the biggest impact on our decor! She shopped for us and picked out the best accents to upscale our outdated living areas. She is honest and has a great spirit! I highly recommend her. I was extremely pleased with my decision to go with Sally in redoing our family room. She has an amazing eye for color, recommending a slight color change in two rooms which completely transformed the look! What was once a dark and depressing room is now a bright and welcoming space. Sally shopped around online for artwork and furniture that she thought would look great in our new space. She is kind, flexible and all around a great person. I highly recommend her, we’ll definitely be utilizing her services again! Sally is both professional and an exceptionally easy person with whom to work. Our office needed an overhaul, but using what we had on-hand and without doing any structural or painting changes. From simply moving artwork around on a wall to completely changing the traffic flow in our main reception, Sally made effective changes that made sense. Although I was apparently born without any design sense of any type, Sally was able to ask the right questions to help our office achieve the goals for which we were looking. Sally was great to talk to on the phone. I can tell she is very knowledgeable about her profession. We haven’t gotten together yet and I am very excited when we start working together. I didn’t check work quality only because we haven’t started yet. I am absolutely positive I will be checking that once we finish. NO DOUBT! In a chaotic world, Sally Fretwell helped me create my own sanctuary. Even though my home is modest, her suggestions had a huge impact. Sally is absolutely correct when she states that we should never underestimate the importance of color. Her color suggestions enabled me to turn the negatives of my home into positives. I am happily at peace. February 12, 2019 Sally has an incredible eye for color. We followed her recommendations and are home looks incredible. We called Sally out of the blue. We sort of knew what we wanted to do with our home but needed someone to put it all together – and have opinions to make the place more seamless. She did all this and more. We couldn’t believe what all we accomplished in the very first day – at a completely comfortable cost. We’ve called Sally back multiple times because her eye is so good; her value is amazing; and her understanding of how we live is spot on. Don’t hesitate to call her. She’s that good and your house can be a beautiful home, just like ours is now. Sally is Wonderful! Down to Earth, talented, and quick. I needed some help getting my small cottage ready to sell. Sally quickly and easily had really good suggestions that I wouldn’t have thought of on my own. She immediately got to work rearranging my rooms during our initial consultation. She even shopped for art and brought it back over within 2 hours of our initial consultation!! It all worked and helped brighten and complete my living and dining areas. She then shopped online for me and sent options for a chair and dining nook she suggested. Her prices are fair and I’m so happy with my initial results that I’ve asked her to come back and help me add some other finishing touches before I put my house up for sale. Do not hesitate to call Sally for design advice no matter how basic! She will save you time and money if you are indecisive about what to do. She’s confident, positive, and a great communicator who answered my texts very quickly. I highly recommend hiring Sally and will be recommending her to all my friends. Realtor LOVED what I did to the house. She kept saying, “It looks so much bigger than I remember”, and “so open”. Thank you! Send me some cards please. She knows lots of people. Especially in “Safety Harbor”. Sally was a joy to work with! Her knowledge of color, lighting, etc. is phenomenal and she was able to guide me with the right choices for my condo. Sally also made several suggestions regarding furniture placement and positioning of accessories which worked very well and helped reassure me regarding some of my previous choices. She also helped with ordering paint and recommending some home furnishings. I am extremely happy that I contacted Sally and would recommend her without reservations to anyone wanting assistance with design or decorating! I called Sally to help me figure out paint color and to design my new house. She responded right away and came full of ideas that really helped me. She was tuned in to my budget and really help me make decisions that helped my budget too. She has great energy and is great at tuning into people so the things she recommends are a “good” fit. She recommended so many things I would have NOT picked out myself and I am so glad I called her.. My house feels so good and I will be calling her again. Remove popcorn ceiling, put in knockdown ceiling and paint ceiling. Buy new furniture for formal living and master bedroom. Remodel Florida room take down cedar wood walls and put up drywall. Put in archways where there were French door openings. All the paint colors Sally picked out for my house are perfect and beautiful. We love the ceiling color and the walls. We are super happy with the paint colors. All the furniture Sally picked out for our house is perfect too. We are so happy with our experience with Sally. Everyone should use her. She was very professional and in touch with our project and what we wanted to accomplish. Sally responded to all my questions during the whole process. I highly recommend Sally for your design needs. A good friend had Sally tour her home and loved her recommendations for wall color throughout. I did the same and had an equal experience. Sally looks at your home and décor and makes great recommendations as to what is the best color that suits your style and furniture – with emphasis on daylight, flooring and even ceiling color. Can’t wait to start on repainting! This customer rated you highly for professionalism, responsiveness, value, and punctuality. I am having a great experience with Sally. She has an unbelievable eye for color. She makes it possible for people like me with a limited budget to reap the rewards of working with a professional decorator. You tell her your vision for your home and she will make it a reality. This customer rated you highly for responsiveness, value, punctuality, and professionalism. Dianne and I would like to thank you for bringing out the beauty in our home. The colors you selected make our home so warm and inviting. I also must add how relaxing each room feels. All our friends and neighbors just raved about the color selections. It is amazing how color can affect our mood and spirit. I truly enjoy our sun room now, the “Burano Bridge” color just made the room pop with our furniture etc. Every room turned out gorgeous. Your paint colors truly added beauty and value to our home. I will highly recommend your paints and your consulting service to anyone considering painting their home. Faded Stucco, Foyer, Living room, Dinning room, Utility room, our Master bedroom. On behalf of the entire Gulf Harbors Yacht Club Family, especially me, Donna, John & Ed, we thank you for your generous donation of time, talents and equipment. The Club has never looked so good, and we’re not even done yet! The feedback from our members has been terrific.. we so appreciate all you have done. It is with great pleasure that I write this testimonial for Coastal Design by Sally Fretwell. I am the owner of Rejuvenate Salon and Spas. We are a salon and spa management company specializing in Senior Living. I hired Sally Fretwell, to redesign one of our salon’s in a senior living community in Palm Harbor, FL. Sally provided invaluable guidance in regard to color schemes, furniture selection, painting, lighting, and accessories. The best was when we opened and all of the residents and staff members couldn’t get over the wonderful transformation. They all said that the salon had a serene and calming feel. Rejuvenates mission is to create an experience with every service. It was a pleasure to work with Sally, she Listens to the client, and works hard to understand the needs of the client. She is a great person and very comfortable to work with. 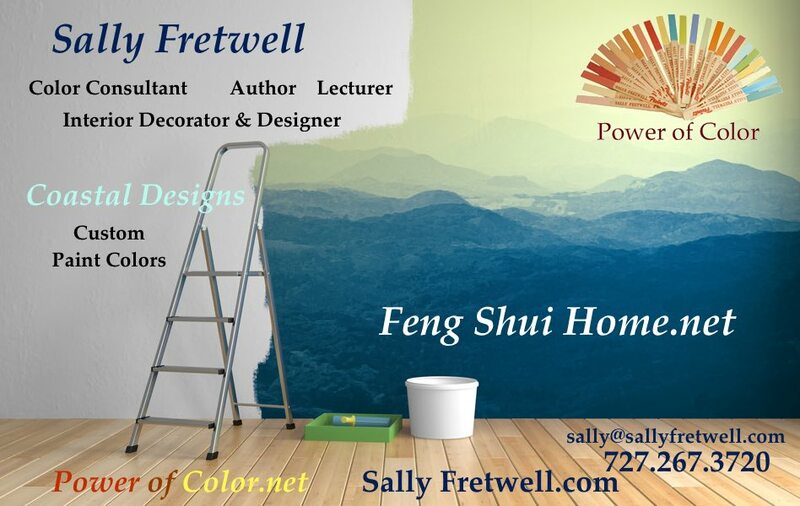 I would highly recommend Sally Fretwell to handle your interior decor project! This customer rated you highly for work quality, responsiveness, punctuality, professionalism, and value. Sally was very responsive and offered creative ideas at a reasonable price. Great experience! Sally Fretwell of Interior Coastal Designs, came highly recommended, and that she was! The Gulf Harbors Yacht Club was in dire need of interior renovation and decor updating to improve the ambiance of our Club. Sally was always timely and in a professional manner, available with great thoughts and ideas which were applied to enhance the Club’s interior decor. All comments by members have been positive and the overall results greatly appreciated. 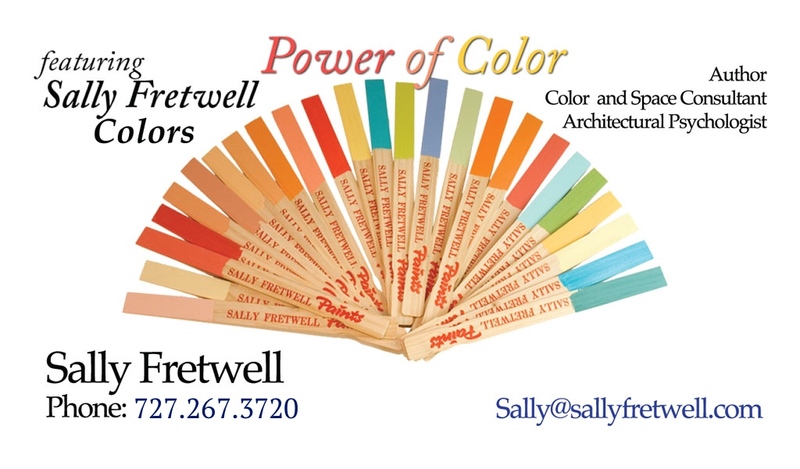 I came across several books by Sally Fretwell about using beautiful color combinations and I loved her warm and vibrant color choices. Sally helped us choose paint colors for our house and they look wonderful. I never would have had the guts to choose such bold colors without Sally telling me they would look great. She was right! Sally has an amazing sense of color; we had cabinets already installed (pure white), she worked around the colors for back slash and colors for walls ceiling and did an amazing job. I would highly recommend her for any interior design job. I have worked with Sally for 20 years. Every home we have lived him as felt better for her touch. Her knowledge of Feng Shui and her understanding of people is phenomenal! All Feng Shui means when you get down to it, is the ability to take advantage of optimum space planning. The understanding of how to open up a space to provide for maximum living area. In one of Rachael’s homes we added a new front door with glass. We opened the walls to add only a few feet, existing space, but just needing to be used properly. The goal was to create a true defined entrance. The whole house was transformed by this small change. She went from having a dark, tiny, closed in area, where you could barely get into the house with groceries. To an open light filled entrance that feels grand and reflects the architecture of the rest of the home. We started working with Sally nearly 18 years ago. She has an easy, generous personality, professional manner and a great eye for every component of your design project. Her color choices are spot on and take into account room layout, goals, people’s personalities and more. She’s helped us design rooms from the ground up to simple changes of paint and accessories. Wouldn’t be without her. Sally was everything we were looking for. She quickly analyzed our style and found great colors for our house. We were more than happy with what she was able to do in a short amount of time. We definitely recommend her if you are looking for someone to help you with your paint project! Sally was wonderful to work with. We have been having an impossible time choosing new interior paint colors. She immediately saw what we were working with and had terrific suggestions. Can’t wait to finish this project. Will call Sally for help in the future and definitely recommend her. This customer rated you highly for work quality, responsiveness, value, punctuality, and professionalism. Sally has a incredible for color. We couldn’t be happier with the colors she suggested for the interior of our house. They look fantastic. If you’re ever struggling to decide on paint colors – call Sally! This customer rated Sally highly for work quality, professionalism, value, responsiveness, and punctuality. Sally is an incredible decorator. I was starting my clinic and I hired her to help me out. She understood my vision for my clinic and did a phenomenal job incorporating that into my clinic. Since mine was a start-up business, she was was very aware of the various factors including limited time and budgeted resources. She worked on my clinic very promptly and found me amazing art pieces at great value. I absolutely love the custom paint color that she made for my clinic! Besides that, I admire her punctuality and strong work ethic. She would do incredible even for business owners!! I look forward to working with her in future for my home interior decoration needs as well.